First thing you have to do, obviously, is to book a flight! If you're a budget traveler like me, then you should be a promo fare booking expert by now. An absolute MUST. Haha. I don't book flights if they're not on sale. Except for that one time during Laboracay when I didn't make it on time for my flight so I had to do an emergency booking from the airport. Booo. For this trip, I booked our flights for FREE!!! For serious. Not even kidding. 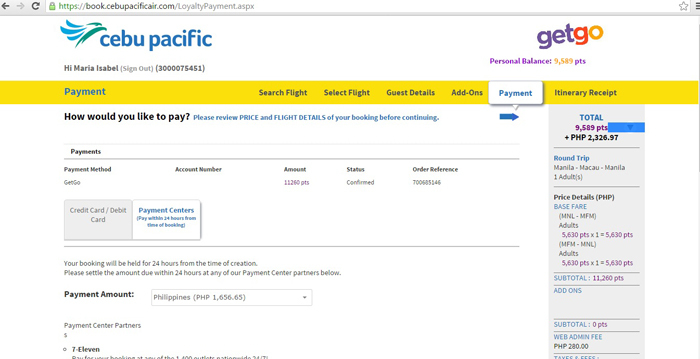 I just used my Cebu Pacific GetGo points which was given to me, plus points I earned from my past CebuPac flights. It's so easy to earn and redeem points! GetGo is a lifestyle rewards program that allows you to accumulate points on your everyday spending (on groceries, utilities, gasoline, etc.) and redeem those points for a free flight. It's similar to SM Advantage card, but for flights! Haha. Signing up is so easy! Mga 5 minutes lang promise. If you're planning to sign up, input my GetGo number as referral please. I don't know what will happen if you do, but do it na din. Haha! Here's my no: 3000075451. Thanks in advance and love you! Hihi. There's a one-time charge of P150 for enrollment. That's it! And you get to enjoy all the perks that comes with being a member na. You have the option to have your GetGo card delivered to you. Easy breezy right? Earn, redeem or convert points! You may earn points by: taking a qualifying flight with Cebu Pacific Air or Cebgo, making a qualifying purchase transaction with our partners (you need the physical card for this), and converting points earned from one of their partner rewards programs to GetGo. How many GetGo points do I earn per flight? You will earn 1 GetGo point for every 5 Philippine Peso (or equivalent) spent on the base fare and select add-ons with Cebu Pacific Air or Cebgo. Note that there is no partial earning of points allowed, and the earn mechanics may be varied at any time without prior notice. 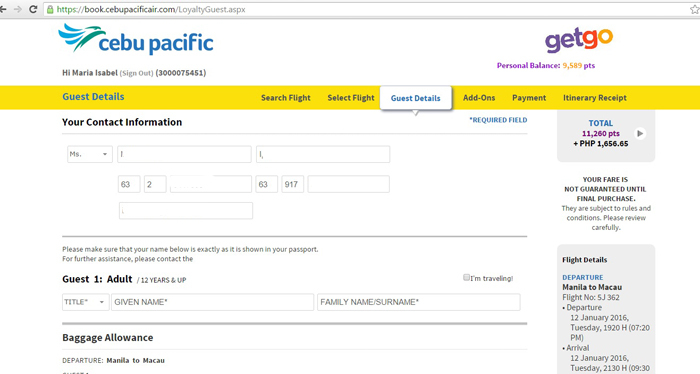 What if I forgot to input my membership number when I booked a flight? Do I still earn points? Yes and yes! You can submit a retroactive claim for the points by logging in to the GetGo Website or by contacting GetGo Team. 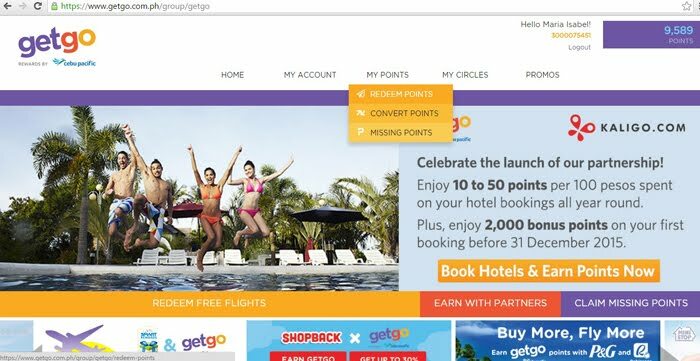 Simply login to the GetGo website, click on MY POINTS -> MISSING POINTS, and fill up your flight date, flight number and your 6-character confirmation number found on your itinerary. GetGo members get to enjoy exclusive sale events! Bongga! So for our trip, I waited for a sale announcement before booking. Once I received an alert, I immediately logged into my GetGo account and clicked on redeem points! 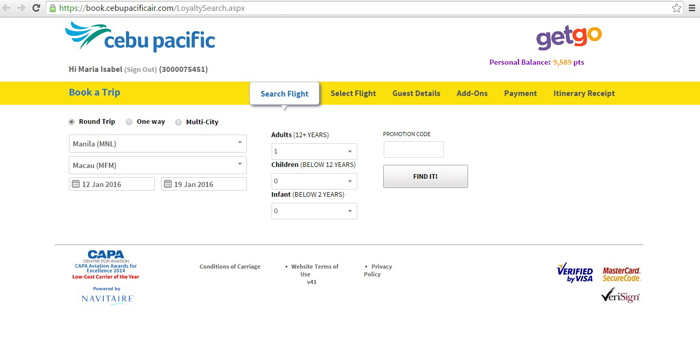 A new page will then pop up which leads to Cebu Pacific's website. Instead of cash, you will see how many points are needed per flight. Cool! I had 20,000+ points in my account, so I shared half of it with Nico. Yes, you can do that! There's an option to share with family and friends when you log into your account. I created a "Sharing Circle" and I added Nico so he can also access my points. You can add up to 7 people in your circle! You can also earn points together and pool it so you can share and redeem after. :) Ang galeeeeng. 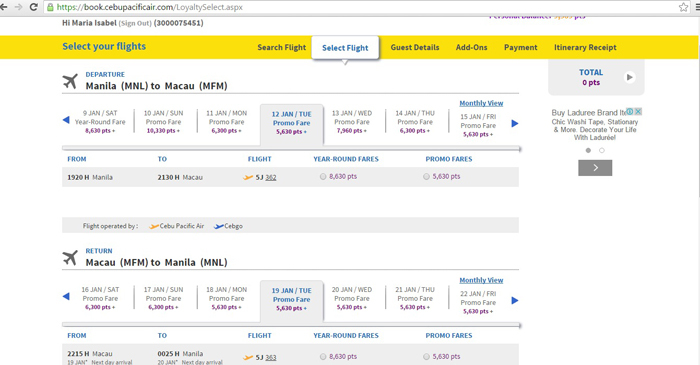 We only needed 11,260 points each for a roundtrip ticket to Macau:) We paid P1600+ each for the excess! Not bad! Booked this small room for P1,200 a night via AirBnB! Stayed here for 2 nights. Nico and I arrived 2 days before my sister, so we booked a room for 2 via AirBnB because they offer cheap rooms in guesthouses and condos owned by locals or foreigners. We didn't want to stay in Chungking Mansions (but actually okay lang naman pala dun) so we chose this small room near Austin MTR. It has no window and it's quite small but for P1,200 magrereklamo pa ba ko? Haha! It's also just a few steps away from Austin MTR (as in across the street lang!) and the room's pretty basic but clean! We also had our own toilet and bath with hot shower. Important yun. Haha. More on our stay here on my next post! This room was priced at P3,600 per night and we booked it for 4 nights. Total was P16,000+ including fees but only paid P13,000+ thanks to the SMARTAirBnB promo! Just use your Smart sim card and text SMARTAIRBNB to 2855 to get your coupon code. Use it upon checkout and you get P2,500 discount! 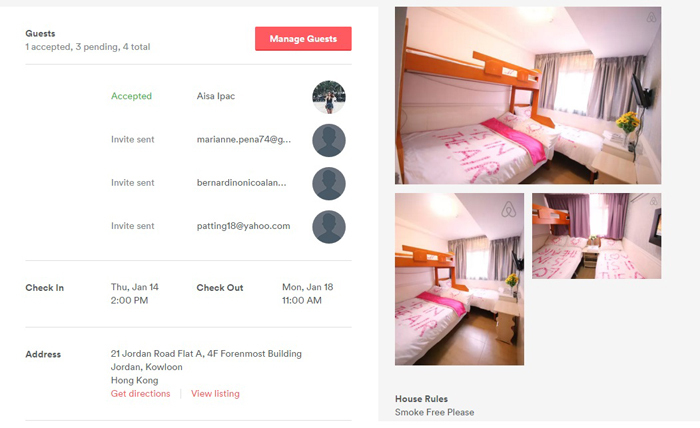 Minimum booking is P8,000. We transferred to another guesthouse after 2 days because our sister and cousin was also joining us. We booked a bigger room in Nathan House, Jordan. The room has 4 beds but was super small (you can only open 1 luggage at a time), but it was a pretty decent place to stay in if you're just looking for a place to crash after a long day of touring around. It was literally just beside Jordan MTR Exit A! So convenient. 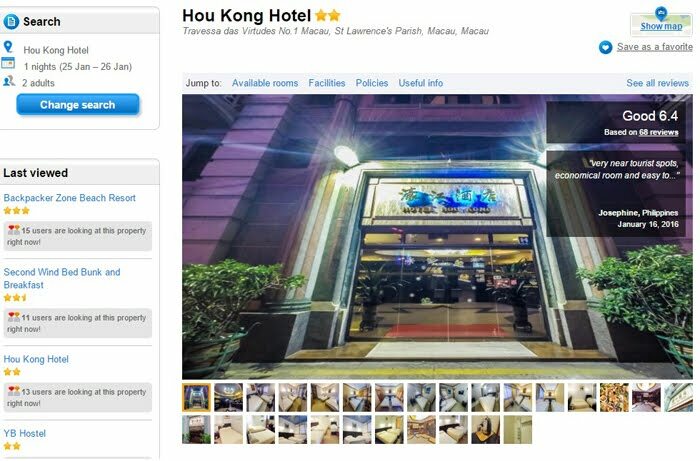 It's located along Jordan road (a major road in HK) and is surrounded by many establishments, restos and shops. We paid P3,200 each for 4 nights stay. Review on my next posts! 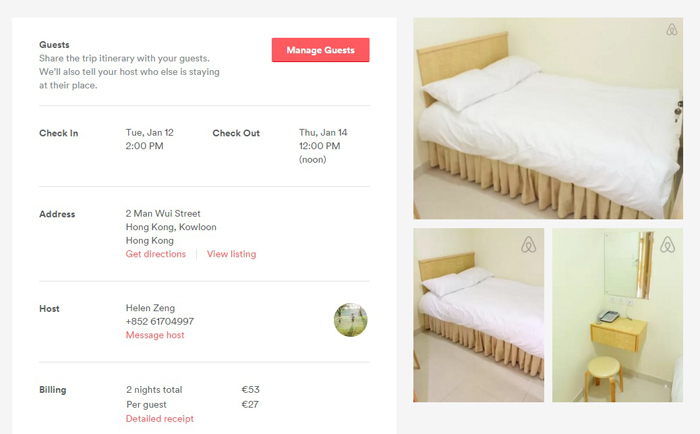 Cheap hotel in Macau! Booked 1 night stay here for P3,870 a night for 3 persons. 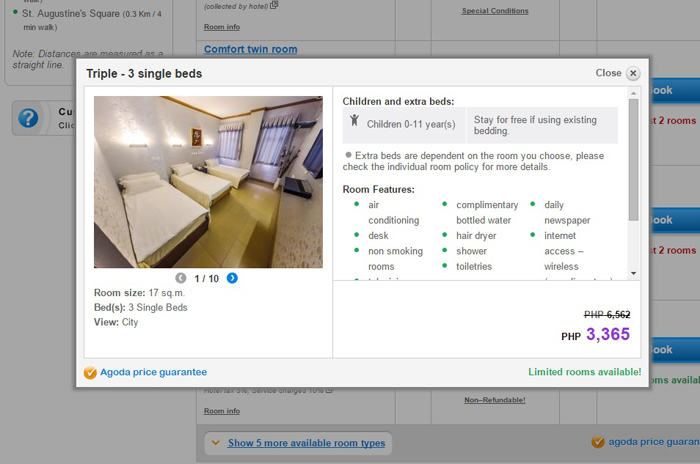 That's more or less P1,300 per person per night. Not bad! Accommodations in Macau's pretty expensive kasi. After booking our flight and accommodations, time to budget our pocket money! At dahil OA ako, I panicked and brought more than we needed. Haha. To sum it all up, I just spent P15,200 as pocket money! If you add airport fees, my extra 15kg baggage allowance and all our accommodations, total will be P23,400 for an 8-day vacation in Hongkong & Macau. One could actually survive with just P12,000-P20,000 for 8 days! Mejo nagmahal lang coz we had to spend $180 hkd each for a round trip cable car ride going to Lantau or Ngong Ping village, bought an $70hkd umbrella there (no choice, it rained so hard huhu), paid more or less $50hkd for our train tickets to & from Disneyland, spent more or less $300hkd shopping & paid $340 hkd for ferry tickets from and to Macau! So that's more or less P5,600 extra expenses. So, if you've been to Hongkong before and you want to go back and just chill in the city, you could definitely do it at a much lower budget! If we didn't go to Macau and did not go to Disneyland or Lantau or went shopping, from P23,000 our expenses would lower down to P17,000 each. Not bad!!! Will share detailed itinerary in my next posts! Abangan! luv your posts about your lakwatsas!